Solly March has been challenged to take his talent to the Premier League stage by his manager. 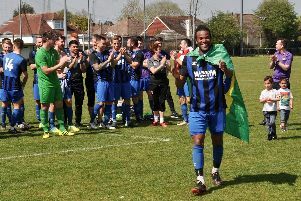 The Hailsham-born winger is another homegrown success story for Brighton & Hove Albion and manager Chris Hughton speaks highly of his potential. At just 23 years old, the former Lewes midfielder was a shining star in the Seagulls promotion campaign last season. He netted three goals in 28 appearance, but was a consistent pain to opposition full-backs. He continued that against Crawley Town on Saturday, opening the scoring and being at the centre of the action in the first half of the 6-0 drubbing, playing wide right in the absence of the injured Anthony Knockaert. March missed out on England under-21 Euro duty in the summer due to heel injury, something that Hughton feels might have benefited the youngster. The Albion manager believes if fit, he can bring his talents to the top flight whether that be from the bench or in a starting role. Hughton said: “He had the injury last year and what Solly has needed is a good pre-season. He ended up not going with the under-21s and from out point of view, that was a plus. It meant he was with us from day one of pre-season and we need to make sure we get a good and full pre-season out of him, but there is no doubt that he is a very talented young player. “If I look at the creative players we have got he comes into the category and what he needs now is that consistent level of being fit, available and working hard, but we know that is the quality he has got.